← Big Game Hunter: Destroy All Humans! The Ultimate RPGs…from the beginning! If you know me, or am a reader of my blog, you would know that I hold the Ultima RPG series in the highest regard. That is why I am very excited that Good Old Games (or GoG as it is otherwise known) has saw fit to add Ultima’s I through VI on the service! Ultima IV was the first to be released (for free), the rest were released in three-packs, and each pack is only $6, works out to $2 per game (for the math challenged). So I took my first steps to returning to the RPGs of my childhood and purchased the first three games, The Age of Darkness Trilogy, Ultima’s I, II, and III (Exodus). What follow is a brief pre-history of the Ultima universe so that we can pick up the story with Ultima I. 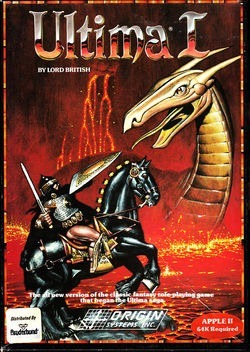 Even though it is the first Ultima game there was a fair amount of pre-history in the form of games. Before The First Age of Darkness there was The Era of Darkness. Many years ago, while the land was under the cumbersome name of Akalabeth, there was a young mage named Mondain whose father had promised him the secret of immortality when he completed his magical studies and proved had his worth to society. But the impatient Mondain would have none of it, so he slew his father and stole the ruby of power, which was the actual source of immortality. With this ruby, Mondain attempted to conquer the realm, but was thwarted by Lord British, master of white magic. British then summoned a stranger to our land to become a knight and fought the evils that still roamed the land. After doing so, the Stranger left the world, which was then renamed Sosaria, in honour of the sorcery used to combat Mondain. The last quest of the aforementioned knight was to rid one last mountain, the mountain Drash, of its evil inhabitants. The stranger climbed through the depths and destroyed all the fiends that resided within. Following this least-known of the Stranger’s adventurers–some say it is merely a jest–our Hero left our world, which was soon renamed Sosoria, in honour of the Sorcery used to destroy Mondain. Mondain was gone, and assumed dead. But he had mastered immortality, and came back with a vengeance. This time, he had turned the ruby into a black gem of evil, and his might was too much for even British to bear. Again Lord British summoned the stranger, and again did good triumph over evil. The Stranger chased Mondain through time itself and eventually slew him. The magical aftershock caused the four continents to break apart, and each became a world of its own. Ultima I stands as the only Ultima game that I have completed, and I along with II are the two games in the series that stand apart from the rest with a mixture of sci-fi and fantasy story telling. So with that, my goal (and I always set a lot of these goals) is to over time complete the available Ultima games. And even though I and II are quite different from the rest, I do want to see them through also. So check back (over the years) as I try to complete this lofty goal. At least the technology is here now to offer the gamer a smooth, non-loading, ride which is quite different than my Commodore 64 experiences. Now off to see Lord British! This entry was posted in Commodore, PC, Retro, RPG. Bookmark the permalink.